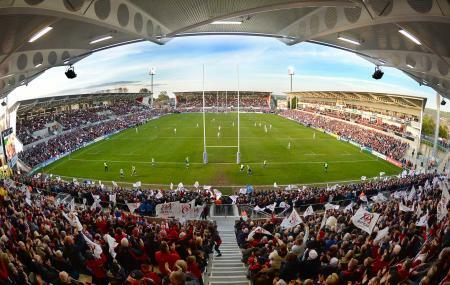 Kingspan Stadium, owned by the Irish Rugby Football is the home of Ulster Rugby. The historic ground was opened in 1923 and has been staging rugby matches ever since. The stadium hosted 18 international matches, including a pool game in 1991 and 1999. In the premises of the stadium is a kukri shop from where fans can buy Ulster Rugby merchandises. Ticket prices will differ with matches. How popular is Kingspan Stadium? People normally club together St. Colman's Church and Belfast Exposed while planning their visit to Kingspan Stadium. It was my first time going to a rugby match. I was impressed with the stadium and felt it was very modern and has a good layout. The location is quite good and the stadium is easy to get to. The facilities are good and its possible to purchase alcohol within the stadium. There are lots of food stalls serving burgers, sausages etc. The terrace section felt quite crowded so i would recommend getting a seat if you can. Great evenings craic at the rugby. Family stands very suitable for young families. Good atmosphere in stadium as always. Enough toilets. Nice when Ulster win on the night! If you enjoy sport you will love Ulster Rugby at the Kingspan Stadium. Great Stadium to watch sport, not a bad stand in the ground. Great atmosphere. Be careful if it's a wet night to wear the waterproofs as the roof doesn't cover the standing area! Very good facility easy to watch the ruby and get a beer.Free bus service into Belfast after the match.Would return.